"Breastfeed hands-free while on the phone or shopping" is often mentioned in the same breath as babywearing. In these times of breastfeeding controversy (which I actually think is positive, my motto being any publicity on breastfeeding is good publicity), it can be useful to remind mothers that they can breastfeed discretely in a sling, any time, anywhere. But how true is this? How many mothers, and more importantly, how often do mothers breastfeed in a sling? If I had a pound every time a new mother came to me with a stretchy wrap she had just bought, asking me to show her how to breastfeed in it, I'd be rich. Well not really, but no harm in dreaming. Doing the above while carrying on walking and not drawing attention is pretty difficult in those first weeks. Remember, breastfeeding and babywearing are skills; combining the two skills can take time and practice. In reality, the motion and bustle will most probably send the slung baby to sleep and keep him content for the duration of the shopping trip. And when at home, what a great opportunity to sit down, or even lie down. So is it a lie? No, merely an exaggeration. 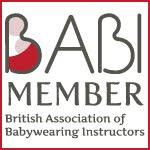 If this is the reason you want to babywear, then be prepared to be disappointed. In the meantime, I will carry on mentioning the "breastfeed discretely, hands-free" benefit. Even though it is akin to Mission:Impossible for many mothers, it becomes quickly irrelevant as mothers and babies discover the real benefit of babywearing: making life easier and much more enjoyable for everyone.